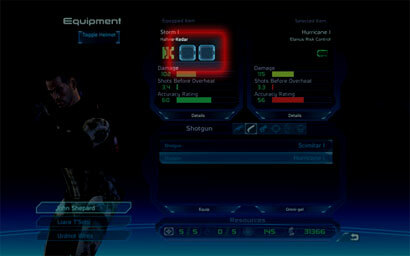 Open the inventory and click the box(es) to the left of the item’s coloured icon. This will show all the upgrades in your inventory for that item. Maybe I just missed the relevant part of the Inventory tutorial (was there one?) but it wasn’t immediately obvious to me how to use weapon and armour upgrades. I knew I was looting items I could use and was wondering where they went. After some unsuccessful googling I finally figured it out so I thought it deserved a post. You just saved the lives of countless mind controlled civilians on Feros. Before you please complete the CAPTCHA below. Sorry about the CAPTCHA but the SPAM was killing the site. I get thousands a day. Minima Plus is based on blogger template Minima, originally by Douglas Bowman. Enhanced and ported to Wordpress by Theron Parlin. Further editing by Sean.